It looks as though Nintendo's obsession with porting games to the Nintendo Switch will never come to end. However, this port will be something that Mario fans will be excited to hear - a Super Mario 64 enhanced remake will be coming to the Nintendo Switch! Super Mario 64 was one of the best games released for the Nintendo 64, critically acclaimed as one of the greatest games ever created. A remake with HD graphics will definitely be something that gamers will look forward to. There had previously been a remake released on the Nintendo DS - Super Mario 64 DS, along with Virtual Console releases on the Wii and Wii U. It is believed that Super Mario 64 Deluxe will be true to the original N64 game and feature all 120 power stars inside Princess Peach's castle. The main enhancements are completely revamped HD graphics along with updated audio with a newly recorded soundtrack. The source that we spoke to from Nintendo says that there will be bonus stages, new secret areas and additional power stars included beyond the standard 120 stars, however no specifics were provided. There were whisperings that some of the stages from the cancelled Super Mario 64 2 might be included. SM128C was able to obtain an early SM64DX screenshot featuring a co-op mode with vertical split screen. 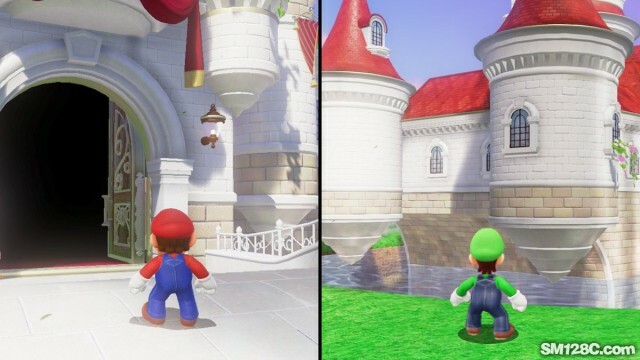 It appears that the character art and renderings of Peach's castle from Super Mario Odyssey will be reused - not a surprise given that the castle closely resembles what is seen in Super Mario 64. The co-op gameplay can be on a single Switch console with split screen, or for full screen play on two Switch consoles (connected using local wireless or the Nintendo Switch Online service). Co-op play was long rumoured to be a feature of the cancelled Super Mario 64 sequel. Co-op play in a 3D platformer has been demonstrated earlier with Super Mario 3D World for the Wii U - the first for a Mario 3D platformer. However, a split screen co-op mode allows for a unique type of exploration that will provide gamers with a brand new experience. Super Mario 64 Deluxe is scheduled for a worldwide release on September 29, 2019 - the 23rd anniversary of the original Super Mario 64 release in North America. If you enjoy April Fools jokes, check out the April Fools jokes archive in the Specials section. Don't forget to come back next April 1!